Resort village on Otsego Lake that’s home to the Baseball Hall of Fame. – What is Cooperstown? It was a capital idea to found Albany on the banks of this river. – What is the Hudson? The atrium seen here is in the New York City building named for this man (pictured above) because of his finance news service, not his mayordom. 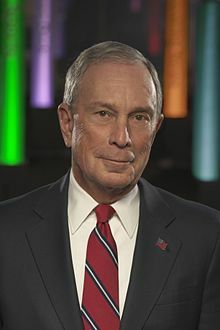 – Who is Bloomberg? Some say this word applies to anything north of the Bronx; it’s the name of a medical college in Syracuse. – What is Upstate? The Finger Lakes city shares a name with the home of Odysseus.” – What is Ithaca? Living most of my life in New York, I got all of them correct. How did you do? This entry was posted on March 24, 2019 at 4:00 pm and is filed under About New York City. You can follow any responses to this entry through the RSS 2.0 feed. You can leave a response, or trackback from your own site.